Hostmysite.com :: How do I enable Spam filtering for my domain using SmarterMail? 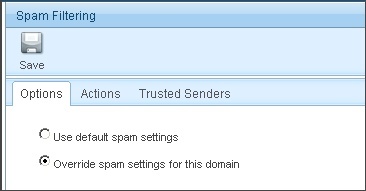 How do I enable Spam filtering for my domain using SmarterMail? The following article explains how to enable Spam filtering. SmarterMail includes many advanced anti-Spam measures that will help keep away unwanted junk mail. 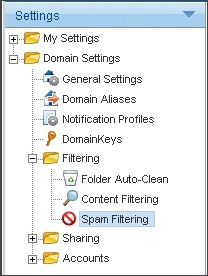 Customizing Spam filtering for a domain will apply the filter settings to all accounts under the domain. Use default spam settings: this option accepts the default Spam options provided by HostMySite.com (the settings will be displayed for your reference). If you choose this option, please skip to step 9. Override spam settings for this domain: this option overrides the Spam options set by HostMySite.com, allowing you to choose specific actions to be performed on e-mails with a low, medium, or high Spam priority and also to assign individual "check weights" (for each check that an e-mail fails, a weight is added to its overall Spam probability score). Reverse DNS: This check determines whether or not the mailserver delivering the message to your account has a Reverse DNS record. For example, Reverse DNS is now required by anyone sending a message to AOL clients, so if someone's server fails this test they would not be able to send a message to any AOL users. SPF Pass: Indicates that the email was sent from the server specified by the SPF record (more likely good mail). The weight you set may be 0 (for no effect) or a negative number, thereby reducing the Spam rating. SPF Fail: Indicates that the email was sent from a server prohibited by the SPF record (highly likely Spam). Set this to a relatively high weight, as the probability that the email was spoofed is very high. SPF Soft Fail: Indicates that the email was sent by a server that is questionable in the SPF record. This should either be set to 0 or a low Spam weight. SPF Neutral: Indicates that the SPF record makes no statement for or against the server that sent the email. Except in very special circumstances, leave this set to 0. SPF Invalid Record: Indicates that the email sender does not publish an SPF record or there is a syntax error in the record. Since SPF is relatively new, many legitimate domains do not have SPF records. It is recommended that you leave this at 0 until SPF becomes more popular on the Internet.